Research continues to reveal the astonishingly wide range of different phytonutrients in fruits and vegetables (F/V), and that we need a variety of these in order to protect different parts of our bodies. 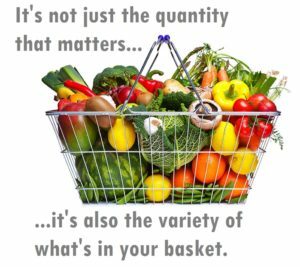 Variety and not just quantity is something we would do well to consider carefully if we want to do the best for our bodies and minds. An October 2011 study 1 looked at whether increased intake of different F/V would have a positive effect on decreasing the risk of specific colorectal cancers (CRC). It may be a surprise to you that fruit juice is associated with an increased risk of cancer – in this case rectal cancer – but it’s been known 2 3 4 5 for a quite some time time that fruit juice is not a healthy option – you may as well drink Coke 6 ! 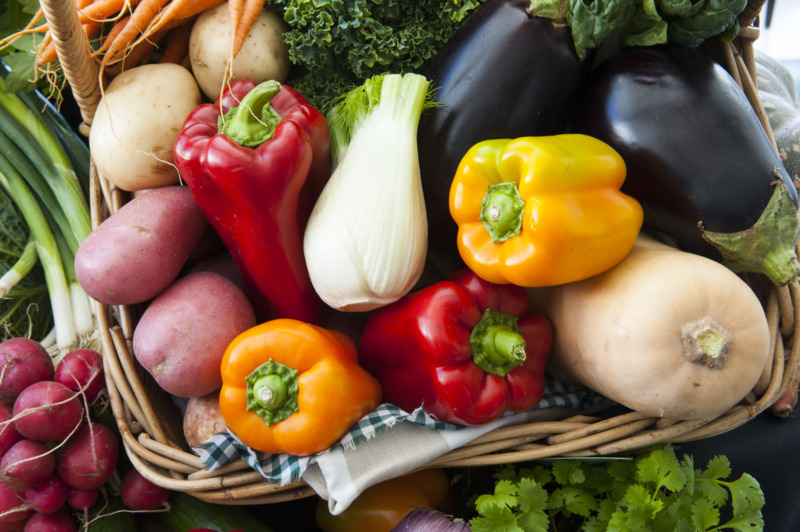 An August 2012 study 7 looked in some detail at how each vegetable contains a unique combination of phytonutrients and, thus, the authors encourage us to eat a great diversity of vegetables to ensure that our diet includes a combination of these phytonutrients and that we thereby reap their health benefits. when cruciferous veg at consumed with other phytonutrient-rich veg, the combination was also shown by the same research to protect against cancer in other organs. onions are particularly rich in two types of fibre – inulin and neokestose (types of fructans). These have been demonstrated 33 34 to have prebiotic properties which encourage the proliferation of beneficial gut bacteria such as Lactobacilli and Bifidobacteria. The fact that different F/V (with all the inherent variations in cultivar, species, origin, preparation method, etc) have different effects on our bodies reveals the fascinating fact that there are specific receptors and proteins for specific substances within specific plants 94 . These receptors are just waiting for the appropriate substance from the appropriate plant. If don’t feed yourself with the relevant plant, the specific receptors don’t respond and your body may suffer as a result. Dr Greger discussed 96 the research showing that there’s a specific receptor for broccoli. And, just to show you how incredibly complex and specialised this whole subject is, there’s a specific receptor for the EGCG in green tea 97 and even a specific receptor for the concentrated nutrient in apple peel 96 ! The foregoing is only a tiny selection of F/V and of the plethora of essential substances therein contained. However, what applies to all of them is that there appears to be no substitute for eating the whole F/V. Pills with chemicals extracted from the plants simply do not do the same ‘magic’ as the whole plant. And we’re only starting to appreciate the vast complexity of the thousands of substances within F/V and the millions of interrelations between difference substances within the same plant and between different plants when consumed together. It’s mindbogglingly complex and it unlikely to ever be fully documented or understood. But so what? 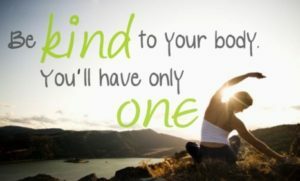 The important thing is ensuring that we do all we can to maintain healthy minds and bodies; and it’s becoming increasingly clear that we achieve this by allowing our bodies to work out the chemistry. All we have to do is ensure we feed ourselves with a wide variety of F/V. This is something that is now much easier for us to achieve, with the year-round supply of a vast range of F/V available at our local stores. Over millions of years, evolution has done the hard work in producing such amazing bodies as we humans possess. Is it really asking such as lot of ourselves to just feed those bodies with a wide range of wonderful-tasting and health-promoting fruits and veg? A. A. Albushita, E. A. Hebshi, H. G. Daood and P. A.